I know it’s still October, but the cold New England weather has me thinking of snowflakes and hot cocoa. And Christmas stories! One Wish started out slow, which annoyed me. However, the author redeemed herself with lovable characters, a gala to die for, and a romance that ended the happily-est ever after, EVER! My favorite part of the book was watching Hayley plan the gala. She was in her element, she encouraged her daughter to help, and she showed such graciousness working with Cynthia. Mandy Baggot successfully wrote in characters that aren’t in most romances – and she gave them substantial roles: a brother, a daughter, a CEO who ISN’T a jerk, and the CEO’s mom who is just lovely. The story includes a heartwarming message about love and loss, and ways to move forward without leaving the memories behind. 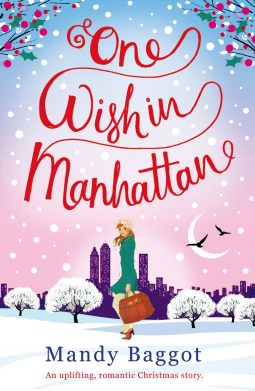 Buy ONE WISH IN MANHATTAN – just 99¢!! !